I’m ready — are you? I’m no stranger to fights. As Ingham County Prosecutor and as Democratic leader in the Senate, I’ve led a lot of tough ones. Fights to protect workers’ rights, fights to level the playing field for everyone, fights to protect kids and to hold government accountable. No matter the outcome, the fight was always worth it for what it said to the people we were fighting for. To the men and women who don’t know if they can count on their paycheck, to the students and their families taking on frightening amounts of college debt, to the women whose access to health care is threatened, to the brick and mortar business owner competing with the world on an unlevel playing field. And it was worth it because it reinforced why I fight. I love the state of Michigan. I love the people of Michigan. And when I was growing up, the opportunities in Michigan were the best in the world. Opportunities to find and keep a good paying job, to build a business, to enjoy our land and drink pure, clean water, to create a future for our children. People moved to Michigan because we offered the best quality of life. I remember when Michigan was bold. When we didn’t just face challenges — we beat them. That’s why I know we can build a Michigan with opportunities that rival those from our past. A state where opportunities are available to every Michigander — regardless of gender or race or religion or who you love or where you were born — if you work hard and play by the rules. And that’s why, today, I filed the paperwork to run for Governor. Together we can build the Michigan we believe in, because we still have what we need most — the strength, the talent, the vision and the grit of the incredible people of this state. For too long, our leaders have been content to manage our decline. We went from leading the nation to lagging. If we want change, we can’t wait for Washington to solve our problems. And we can’t elect the same old politicians, on the same old platforms and expect a different result. We can do better. We deserve better. And we can’t wait. Too many people in Michigan need good-paying jobs, today. Right now, too many small business owners know the deck is stacked against them. Too many families can’t trust that their government is looking out for their health and safety. Too many children aren’t prepared for their futures. And too many Michiganders face the threat of discrimination. It’s never been more critical to join the fight. I’m ready — are you? 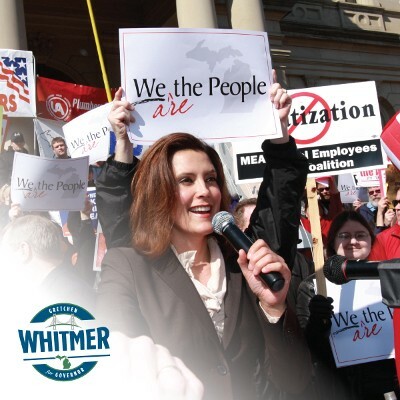 Forward this email to five friends and find out how you can get involved at gretchenwhitmer.com. Join me and we’ll win this fight for Michigan. Democratic nominee for governor in 2018. Fighter for Michigan. Former prosecutor and Senate Democratic leader. Proud mom.